The Hunting product that we offer to our clients is the best in the world. We specialize in Trophy Animals, including many World Records class African Game including Kudu, Sable, Blesbok, Wildebeest, the Big 5 and much more. We plan the hunt to suit the requirements of our clients, with a large variety of game that is available. Our trophy hunting rates include professional hunter services, care of trophies and delivery to taxidermy, transfers from Johannesburg International Airport, as well as a memorable stay in comfortable lodge. Non-hunting companies welcome. Our safaris start and terminate at Johannesburg International Airport . We have no minimum period, however, we strongly recommend a safari of 10-14 days. We know it will take you 3/4 days to acclimatize. It's also important that we hunt with minimum amount of pressure. After all, you are on vacation. All hunts with Africa Hunt Lodge are fully guided by licensed Professional Hunters and we hunt these game animals by way of spot and stalk, safari style or still hunting. The hunts are fair-chase on our network of large concessions in the Limpopo Province of South Africa. All Methods of Hunting are available: Rifle, Bow, Handgun or Black powder are welcomed. 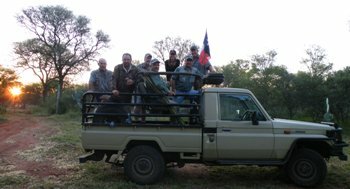 Africa Hunt Lodge has some of the best PH's in the industry including Ewald Ras, Wikus Stemmet, FR Human "Dolphy", and AJ Boshoff "Bosse", all licensed Professional Hunters in South Africa. Africa Hunt Lodge is the African partner of "Texas Hunt Lodge", of Ingram, Texas. Owner of both hunting companies, Aaron Bulkley, has won just about every Outfitting and Guide award in the United States. Texas Hunt Lodge hosts over 750 hunting clients per year, and many of those are clients of "Africa Hunt Lodge" as well. Aaron Bulkley, Ewald Ras, and Wikus Stemmet are certified Trophy Game Records of the World (TGR) and Safari Club International (SCI) Tropaeologist and will score your Trophy animals per request for submission to the Record Book and Annual Trophy Game Awards. Daily rates exclude Trophy Fees for game taken or wounded, Taxidermy fees (packing, dipping and shipping to final destination), Hotel Charges before or after contracted safari period, Air Charters if needed, and Gratuities to staff. UPON ARRIVAL - When you ARRIVE at Johannesburg international airport (O.R. Tambo int. airport) you will be met by one of Africa Hunt Lodge's friendly personal. After the pick-up at the airport you will be transferred in vehicle to the hunting area. The main lodge is situated two and a half hour drive north west FROM THE AIRPORT to a town called Thabazimbi in the Limpopo province. ACCOMMODATIONS - The Main lodge consists of eight luxury on suite rooms, private baths, where you will be staying and dining most of the time. With friendly staff and daily laundry service, there are also day trips that can be arranged for the observers to nearby game parks for photo safaris or shopping driving time approximate 30 min to one hour to get there. HUNTING - A continental breakfast is served at seven in the morning and then hunting begins till twelve when we will be back for brunch. After a power-nap for one and a half hours the hunting continues till dark. After a good days hunting returning to the lodge for a nice hot shower and an open fire under the African sky were a gourmet dinner awaits you and a nice comfortable bed. WEATHER AND SEASON - The best time to hunt will be from March till September, our main hunting season. We are permitted to hunt the whole year but from October till February is it the raining season and temperatures could reach 100 degrees. March till September temperatures are cool in the mornings, 40 degrees, and warm up in the middle of the day too 80 degree, then cool in evening?s semi desert temperatures, so pack a good jacket, light shirt, pants, comfortable boots, and some sunblock. 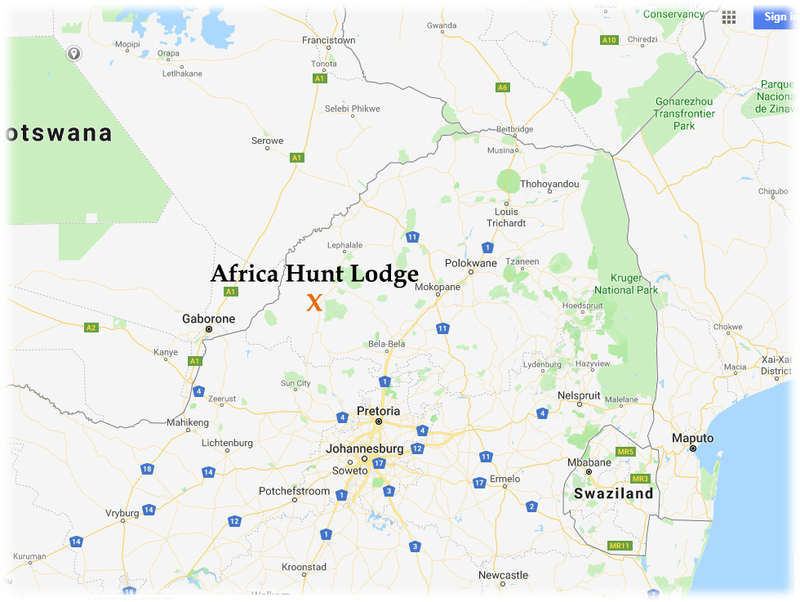 Africa Hunt Lodge is located 257 kilometers from O.R. Tambo International Airport (JNB) and less than 30 kilometers from Thabazimbi.